Ethiopian Culture: What Makes Ethiopia Unique? Traditional clothes for Ethiopian boys pants and knee-long shirts. Traditional clothes for Ethiopian girls are white dresses of woven strips of cloth. 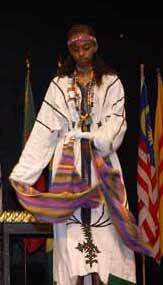 Ethiopian culture is very different from most of the countries in the world, especially the USA. Some of the differences are language, clothes and media. There are many different languages spoken in Ethiopia, but the official language of Ethiopia is Amharic. About thirty million people speak the Amharic language. Amharic is spoken by the Amhara people. The second largest language in Ethiopia is the Oromyna language. This language is spoken by about 30% of the population and by the Oromo people. The third largest language in Ethiopia is the Tigrinya language. Tigrinya is spoken by Tigray people. Traditional clothes in Ethiopia are made from cloth called “cloth of the countryside” (yagaree libs). The clothes are made out of white cotton combined together into long strips. The strips are then sewn together. Sometimes sparkle threads are woven into the fabric for style and a beautiful effect. It takes about three to four weeks to weave enough cloth for one dress. The bottom of the cloth might have decorative patterns. Boys wear pants and a knee-long shirt with a white collar and threads on it for an elegant look. Sometimes they wear a sweater. Boys often wear knee high socks while girls may not wear socks at all. Women wear shawls (netela) as well. The shawl is worn in a different style for different occasions. When girls go to church, they cover their hair with a shawl. The shawl has the sparkle threads at the bottom. Girl’s dresses are called abasha qemis. The dresses are usually white with some different colors at the bottom of the dress. Bracelets and necklaces are from silver and gold jewelry worn on the arms and feet to finish the look. These dresses are worn by most girls in cities and are worn on important days such as New Year (Enqutatash), Christmas (Genna) or at weddings. Generally women will cover their heads with shash (a shawl) or a cloth that is tied around the neck. This is common for both Muslim and Christian women. The older women wear a shawl everyday and other women wear a shawl at special times like when they are attending church. Ethiopians are most famous for track and field. They have won many medals in the big games (such as the Olympics). Soccer is loved by a significant part of the population despite the lack of success the national team. Radio and television are under the control of the Ethiopian government. The single television broadcast network is called Ethiopian Television. In keeping with government policy the radio and television broadcasts happen in many different languages. But there is lack of media is because of high poverty levels and low literacy rates.